For the keen visitors to the Goat Island Marine Reserve, this page describes some interesting aspects of its marine environment. Although the area is somewhat representative of a north-facing exposed coastal shore in northern New Zealand, there are enough special cases that make it an exceptional place and not at all representative. What happens at Goat Island can thus not be extrapolated to more 'ordinary' shores. At the end of this chapter is a unique biogeography that gives more insight in the ecology of this marine reserve. 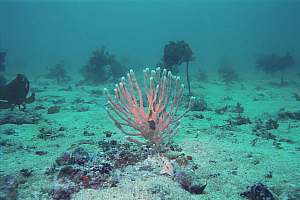 sponge garden: Where sand covers deep rock platforms, a community of sponges can out-compete the stalked kelp. It is a fragile world. intertidal: The intertidal area of the marine reserve is steep and inaccessible on the eastern half of the coast, but wide rocky platforms are within easy reach on the western half. shell trap: Shells washed up on Pakiri beach and transported by waves and currents, get trapped in the first foothills of the rocky shore. This area lies just outside the marine reserve. 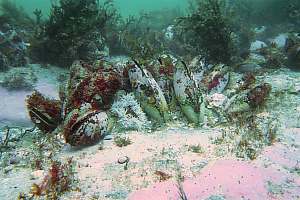 mussel bank: A natural mussel bank with its fascinating community has been left unprotected, outside the marine reserve. Whether it will survive, is questionable. 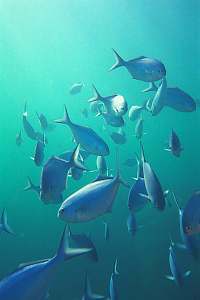 promontories: Promontories, jutting out in the current are where many pelagic fish congregate. shelter: The shelter provided by Goat Island is a unique feature of this marine reserve, apparent from a number of exceptional events. caves: Around Goat Island several kinds of cave are found. Some are barren, some not. night shift: During the night, most of the creatures seen by day, sleep and hide. The sea becomes empty and the night shift takes over. biogeography: A different way of looking at the marine reserve, is obtained by identifying the main influences on the marine habitats in relation to where they occur. It is called biogeography. The marine reserve varies considerably when traversing it from east to west. West of Goat Island, the coastal rocks consist of mudstone. 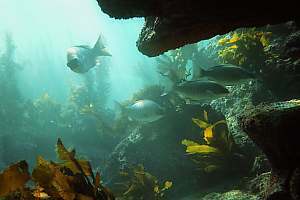 This kind of rock is layered and forms platforms in the sea, often undercut, creating hiding places for many creatures. These rocky platforms are not found to the east of the island. 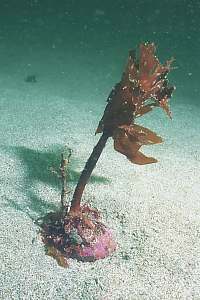 The deep sediment flats are periodically covered with sand, which is unfavourable for the establishment of the stalked kelp. However, sponges are able to survive while covered with sand, and they eventually grow large enough to protrude above the sand. 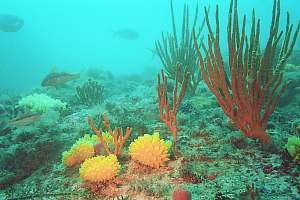 In this manner, sponge gardens are formed with a wide variety of sponges. Because these sponges cannot be distinguished on depth sounders or fish finders, seamen consider these places safe for anchoring. Attached to the anchor, is a long chain, partly lying on the bottom, partly leading up to the boat. 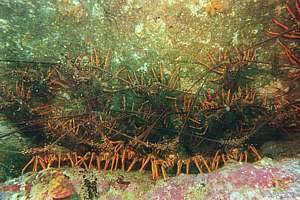 As the tidal current changes, the whole chain is moved to the opposite side, dragging over the sponge garden, and uprooting all sponges in its path. For this reason, the sponge habitat should not be anchored on. Unfortunately, the Department of Conservation has not spent any money on improving the reserve's infrastructure, and has not provided suitable boat moorings. It has not even maintained the system of marker buoys, which was present in the beginning. f000124: sponges on sediment flats are sensitive to damage from anchor chains. f017101: standing on firm rock but surrounded by shelly sand, these sponges thrive where plants cannot. Three rocky platforms are located in the intertidal zone: Hormosira Flats to the right of the beach, Echinoderm Flats to the left, and Okakari Flats at the western boundary by Okakari Point. It is not known why each has a different level, Okakari Flats being highest and Echinoderm Flats lowest. Okakari Flats is too high to be interesting, and is difficult to reach. Hormosira Flats has the deepest rockpools, some too deep to be studied by students. An outlet of the Laboratory's seawater system ends in one of the rock pools, which makes it perhaps the only rockpool in NZ, with flowing water. This pool is also richest in diversity. Hormosira Flats is accessible for a long period in between high tides, which makes it an excellent study area. Most interesting, though, is the lower Echinoderm Flats. Only for about one hour around the low tide, can it be visited. This area has many very shallow rock pools, and many stones and boulders housing a great variety of creatures. When you intend to visit these intertidal platforms, go bare-foot, because your shoes cause damage to the marine life that clings to the shore everywhere. Just take care not to cut or stub your soft feet. Make sure you've carefully replaced all stones you turned. It is a most rewarding experience. A separate chapter will be devoted to the ecology of these two intertidal rock flats. Where the rocky shore meets a large beach, the environment is not something in between the two, but it is unexpectedly different. The beach is characterised by fast moving sand, in which only fast burrowing surf clams such as tuatua (Paphies subtriangulata) can maintain themselves. 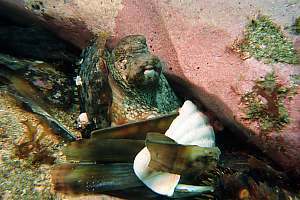 Deeper down, burrowed in more stable sand, one may encounter the fan shell or horse mussel (Atrina pectinata zelandica), and the occasional scallop (Pecten novaezelandiae). No creature, living in or on the sand, while moving only slowly, can escape the brute forces of large storms (See Oceanography/waves). Large waves, which we call swell, rise over the shallows, from about 40m depth. Here they move the water to and fro over the bottom, brushing the sand faster towards the beach than away from it. In the process, burrowing clams, snails and starfish are swept towards the beach from vast distances in sea. It can lead to massive shell wash-ups as shown in the photographs below. Miraculously, such wanton waste disappears within a few days after the storm. Where do all those shells go to? Most become buried by the sand as it resettles after the storm, but a good number travel along the beach, repeatedly washing up on the beach, and off it again, until eventually there is nowhere to go but the peaceful gullies of the reef habitat. Here a massive amount of food collects once or twice a year, giving a livelihood to a community of frugal organisms that are capable of living from binge to famine. When the food is plentiful, they overeat themselves, while growing quickly. In the lean times in between, they borrow from their bodies, being able to shrink accordingly. Not all the shells washed up on the beach die. 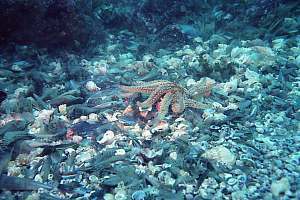 Some end up in the deeper sand of the shell trap habitat, forming dense beds, on which the adaptable octopus feeds. 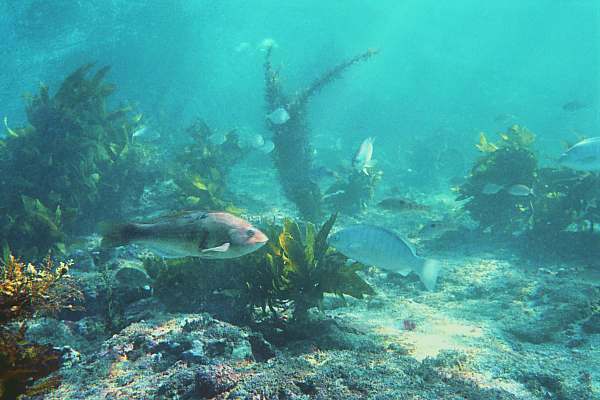 This remarkable habitat lies outside the marine reserve, and is not protected. 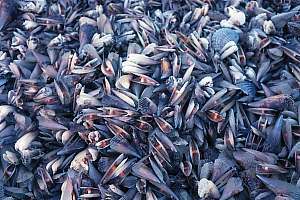 f950728: On 23 April 1995 the beach south of Te Arai Point (West of Goat Island) was covered in young horse mussels, at places 0.6m thick., estimated at 4000m3, or 400 tonnes of meat. Within days, the beach was clean as if nothing had happened. f950726: the bulk of the shells consisted of young (2 year old) fan shells or horse mussels (Atrina pectinata zelandica). Most of these were dead, and altogether there was too much food for the traditional scavengers, the sea gulls. f001210: horse mussel shells and other debris washed into gullies of the rocky shore reef habitat. 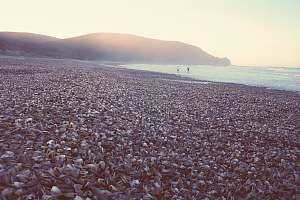 Live shells re-established themselves in the sand at the foot of the rocky shore. f003708: the sand octopus (Octopus gibbsi) is not capable of living without food for a long time, but it is capable of unbelievable growth when plenty of food is available. It is very versatile in finding new kinds of food, which keeps it alive in averse conditions, when it grows only slowly. f003710: sea dahlias (Isocradactis magna) are rare on the East Coast, but in the shelltrap habitat they grow large and colourful. Having large mouths, and consisting entirely of stomach, they can swallow and digest large prey, such as complete shells. What cannot be digested, they expel through their mouths again. 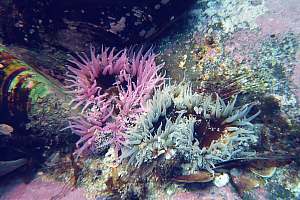 In the lean times, these anemones do not need to shrink (which they can), because they can live from symbiotic algae inside their skins, that convert sunlight to food. f001103: a small eleven-armed prickly star (Coscinasterias calamaria) searches for food amongst the washed-up shells. With smell sensors at the tips of its arms, it can navigate precisely to any source of food, arriving there before others. It then extends its stomach over its prey, to digest it outside its body. The stomach juices are digested further inside its body. These stars are versatile feeders, having many tricks to catch their food. In the lean times, they can last for many months without food, shrinking their bodies as required. Reader please note that the shell trap habitat has been named by myself, and has not (yet) been recognised as such scientifically. Natural mussel banks of green-lipped mussels (Perna canaliculus) have disappeared from wherever they once were on the East Coast, partly because people overharvested them, but perhaps mainly because mussel spat (their larvae) do not want to settle on mud-covered rock. On the shallow rock platforms that are the last rocky outcrops before the long Pakiri Beach, a natural mussel bed has survived. Why? These shallow rock flats are brushed with sand most of the time, a kind of sand blasting which keeps them free from mud and planktonic sediments. Once in a while (every 10 years), mussel spat reaches this site (from the older animals already there? ), and settles only here - not 50m west, nor east. After 2-3 years of growth, the local people gradually start to harvest the mussels, which leads to a complete wipe-out after only a couple of years. In the 80s, the mussel bank was poorly known, and people harvested only the intertidal rocks on low tide. After 10 years, mussels reached 18cm in size. 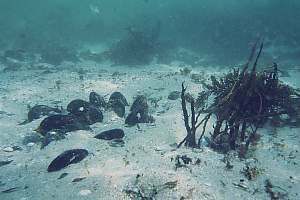 However, in the 90s, the submerged rocks became popular, to the extent that this natural mussel bed may not survive. It is located just outside the marine reserve, and is not protected. 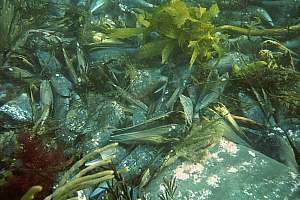 As I write this, in December 2002, not a single mussel can be found on the mussel bed. Nobody had the foresight to leave a few for breeding. f003711: a clump of old greenlipped mussels stands isolated on a sand-polished rocky platform. These were spared because they were considered too tough to eat. (Nov 95) f003712: The natural mussel bank is now and then submerged in sand. Promontories are rocky headlands, jutting out into the sea. Because of their shape, they alter the marine environment in various ways. They distort the tide wave which fills and empties sea basins, resulting in strong currents, benefiting many marine species. 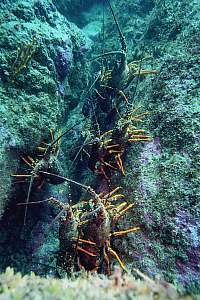 They usually have one exposed side, while providing shelter on the other side, which is favoured by many marine organisms. 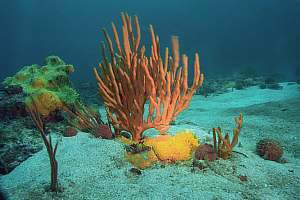 The combination of currents and exposure by waves, causes the sand to be deeply dug out, providing attachment for sponges. 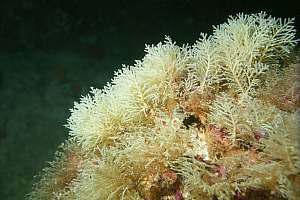 It can thus be said that promontories promote biodiversity, and are thus worth protecting by marine reserves. However, the Goat Island marine reserve stops at the promontory of Cape Rodney. Here fishermen congregate and place their cray pots, with the sole intention of taking fish from the marine reserve, by luring them. 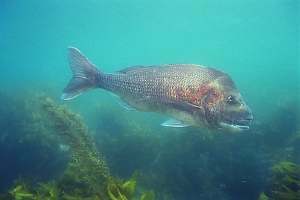 Because fish do not know where the boundary is, this results in an unstoppable drain of life from the marine reserve. f000623: a group of blue maomao lazes about in the open, waiting for the tide to turn, and for their mates to finish being cleaned by cleanerfish. f001225: detail of a blue maomao (Scorpis violaceus), while swimming by. These fish normally live along the outside of Goat Island, where the main current runs. But they are attracted to the beach because people feed them there. Blue maomao are semi-pelagic fish, obtaining their food from the zoo plankton, but needing the shelter of the rock face for sleeping. Blue maomao cannot tolerate murky waters, reason why they are found mainly around outer islands. f002512: The grey maomao (or sweep) (Scorpis lineolatus), looks very much like the blue maomao, but is smaller and shorter. It tolerates dirty water better, and is now gradually replacing the disappearing blue maomao. 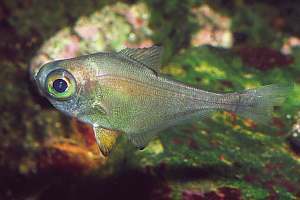 f001017: closeup of a young trevally (Pseudocaranx dentex). 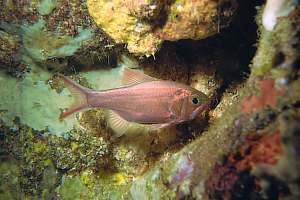 When young, these fish live in small schools, often fossicking in the reef habitats and on the sand. Later they will assemble into large pelagic schools, feeding on zoo plankton, often far away from the shore. However, some remain close to shore all their lives. f022804: Butterfly perch used to be a common fish in the marine reserve, but it is now restricted to the clean currents, such as near Cape Rodney. 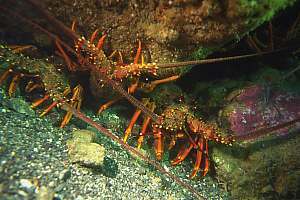 Here they are seen grouped behind a rock face, just outside the current. By night they sleep in shallow depressions of the rock face. The one in the foreground-right, has the facial makeup of a spawning male. f017130: detail of a butterfly perch, (Caesioperca lepidoptera). The presence of an island close to the shore, brings shelter to a large area. Goat Island's shape has been honed by many centuries of sea erosion to what it is now, providing shelter to a relatively large area for its small size. Fish frequent such areas, and where fish congregate, they unknowingly pass the message of safety to each other. Fish attract other fish. Not surprisingly, both density and variety of species is high in the shelter of the island. Like the fishes, divers and snorkellers also benefit from the shelter of Goat Island. It makes the place accessible for more days of the year, and it provides for more comfortable snorkelling and safer swimming. But shelter also changes the environment, making things happen that do not (or in a lesser way) happen elsewhere. f001818: in the deeper parts of the Goat Island Channel, sheltered from the worst of storms, one can find forests of the fragile featherweed (Carpophyllum plumosum), an enchanted forest. f002226: in the shelter of Goat Island, one can marvel the capriciousness of shallow stands of stalked kelp (Ecklonia radiata), which would otherwise grow 10m deeper. The play of light in this shallow seaweed forest is a spectacle to behold. 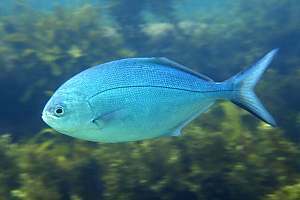 At this very moment, trust is established between the large drummer and the tiny trevally, by the large fish offering its weakest and most sensitive part, its eyes. It faces the cleanerfish with its head high, denoting its turn in the queue. By contrast, all the others bear their heads down, as if saying that they are not part of the game. The top fish has changed some of its fins to pale white, but three others are still in 'pyjamas', saying that they are out of the game. The one in the distance left, has turned pale, saying that is next in line, but it is still facing down and away from the cleanerfish. 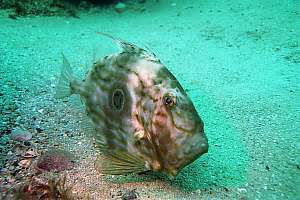 In this manner, the cleanerfish is not distracted, and will pay all attention to only one drummer. 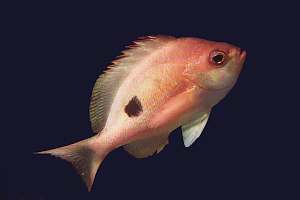 The top drummer will now tilt its body and wave its breast fins, to indicate where the itching spot is, but the cleanerfish has good eyes for these matters. It will go around the drummer, picking sea lice off its skin, until it is satisfied and swims away. Fish like these large silver drummers, can spend a lot of time socialising this way. Watching how fishes behave, is time-consuming, but most satisfying. It requires places where people behave with restraint. If you want to see events like this, don't come on holidays or in the weekends. f002809: a large snapper ('Mr Perfect') is accompanied by a young trevally. 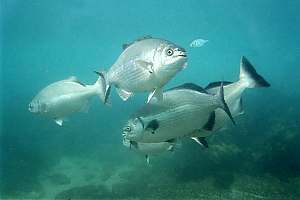 The trevally removes sea lice from beneath the snapper's scales, while the snapper provides protection to the cleanerfish. 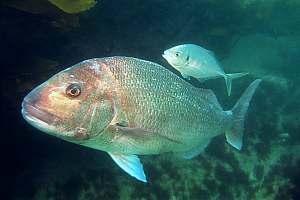 At night they sleep together, the cleanerfish often under the snapper's arm pit. These relationships do not last forever, since other snappers vie for such privileges, and trevallies eventually grow up and swim away. 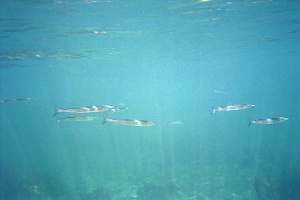 f021026: a school of jack mackerels (Trachurus novaezelandiae) has come to the sheltered shallows for resting and digesting. They had great interest in the photographer, who took this photo and most on this page, while snorkelling. Fish seem to be little disturbed by a freediver's need to go back up each time. By contrast, a diver's bubbles always make fish wary. f001820: after their breakfast, a group of parore (Girella tricuspidata) is speeding home to their communal sleeping den. Here they will spend more time socialising, digesting and resting. Later they will go out again for lunch and dinner. Shelter is very important in the lives of parore. It appears that many fish return not only to shelter, but also to warmer water, which helps to speed digestion, and perhaps creates a feeling of wellbeing because of this. (remember your last big meal?) f002220: for parore, food is easy to obtain on account of the large seaweed habitat in the marine reserve. Here they are resting in a shallow, sheltered spot. f007237: a group of juvenile broad squid (Sepioteuthis australis) swimming over shallow, sheltered kelp. Broad squid live in the deeper coastal waters, but visit the coast for laying their eggs. They do so on a calm night. f001833: schools of pipers or garfish (Hyporhamphus ihi) can be found in the sheltered waters of the Goat Island Channel. Most people fail to see them because they are looking down, rather than ahead, just under the surface. For many organisms, caves and crevices are important niche habitats. For some it is an important shelter in their youths; for others a shelter by day; and for many a shelter by night. 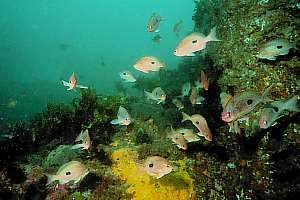 Marine 'hot spots', the places that show high numbers of fish on a depth sounder, are almost always near an undersea cave. 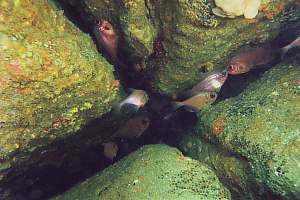 Wrecks provide artificial caves, and are therefore attractive to many fish species. The Goat Island marine reserve is unusually rich in caves, crevices and ledges, and has therefore always enjoyed a high number and diversity of species, compared to other places, regardless of its protective status. f000919: crayfish (Jasus edwardsi) have packed themselves as tight as sardines in a tin, for maximum defence. In this formation, even a large octopus finds them difficult to handle. f004625: a crayfish seeks solitude for the delicate process of moulting - shedding its old skin and hardening a new skin. If it does so in the colony, it will be canibalised by the others. f010720: safety in numbers is the motto of these crayfish inhabiting a crayfish city of which there are only few inside the reserve. Protected by the large males in front, the smaller females and young ones, stay in the back. Before the females moult, they select a free male, whose size is important to them. After moulting, the male deposits a packet of sperm on their sternum (chest), which the females use when ready laying eggs between their swimmerets (pleopods). f010725: females holding on to the backs of the males of their choice. f003505: a crayfish moult (its old skin) looks very much like an animal that has died. On closer inspection, the skin is entirely empty. The animal has pulled itself out of its antennas, legs, eyes and even its delicately branched gills! First it stops eating for one or two weeks. Then it shrinks its body, while secreting a lubricant between its old and its new skin. Then suddenly, within a few minutes, it pulls its chest out of the front part, and its tail out of the rear part. 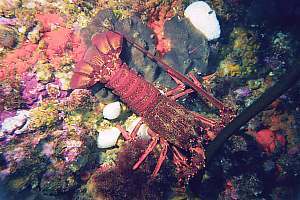 f214312: a female spanish lobster (?) crawls out of her old skin. At the very moment this photo was taken, she shook her tail part off in a single flick. Notice how fresh her new skin looks. 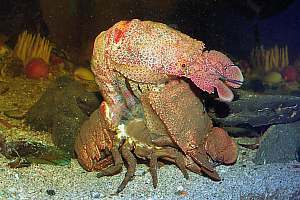 At this moment, the smells produced by the moulting, will attract predators, like conger eel, crayfish and large hermit crabs. Against these, her soft skin offers no defence. To avoid this, she'll wait quietly in a crevice of the reef until her mandibles are hard enough to eat with. For her, the availability of a narrow crevice, is of utmost importance. f018734: a dwarf scorpionfish (Scorpaena papillosus) lives almost entirely in the confines of crevices, unlike its large cousin, the 'granddaddy hapuka' or northern scorpionfish (Scorpaena cardinalis), who lies in ambush in the open, by day and night. 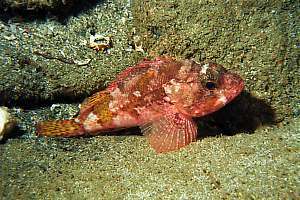 The northern scorpionfish has disappeared from the Goat Island marine reserve, perhaps because it cannot tolerate murky water as well as the dwarf scorpionfish. f213101: the dwarf scorpionfish can be identified by its row of four spines on a bony plate under its eye, followed by two spines on its gill cover. It also has a different face, with wide-set eyes. f006305: for the fishes of the night shift, caves and crevices are very important for shelter by day. This photo shows a young bigeye (Pempheris adspersa), waiting for day to turn into night. 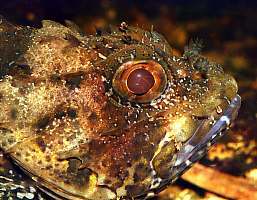 Bigeyes are, like other fishes, born in the open plankton. At the size of about 2cm, they settle down to the reef, but they have not become nocturnal yet. After about one year, hanging out in clear daylight, they start to behave like the adults do. f016915: caves are critical to the lives of red moki (Cheilodactylus spectabilis). They sleep there by night. 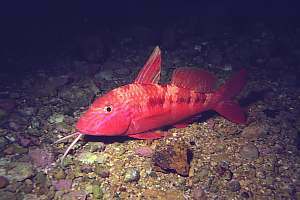 Because red moki are faithful to their caves, they do not wander out of the marine reserve, thus enjoying full protection, and their numbers have rebounded spectacularly. The photo shows a 'moki hole' with some of its occupants. Some moki holes house 50-100 moki by night. To make an evening dive, waiting for them to arrive in small groups at a time, is spectacular. A night snorkeldive in the Goat Island Channel is an experience not to be missed. Make sure you have adequate light. Choose a calm night and clear water, and go in from the beach or a little further to the right. Going in just after dark, is usually done, but a more satisfying night dive begins later. Prepare your night dive by making someone aware that you are in the water, and when you will return. Better still, have someone wait for you on the shore. Bring a gas lamp and place it on a prominent point, to navigate by. You must be able to see it from where you are going to swim. Make sure you are familiar with the place where you are going to dive. Bring a bright waterproof light, such as used by divers and have some spare batteries, just in case. A night snorkeldive or SCUBA dive usually lasts shorter than a dive by day, because of your time appointment. 45 minutes is about the norm. Stay together, because it is often difficult to find one another again. Enjoy what you see together. For divers, a compass is not strictly necessary if you are prepared to surface now and then. Reorientate yourself based on the gas light, and other lights around. Be aware that many lights will be switched off some time during the evening. By night, lit by the narrow beam of your torch, the underwater environment assumes a spooky appearance, which is much more colourful than by day. This is because there is less blue light diluting the true colours. If you can, make an effort to swim down, because this will enhance colours appreciably. There are no animals to fear, but you may blunder into a jellyfish if these are around. In the beam of your torch, some fish such as pipers, may become disorientated and bump into you. f012329: bigeyes (Pempheris adspersa) in a deep crevice, waiting for the night to fall. As soon as it becomes dark, these little fish come out of hiding, to swim in the open water in search of swimming bristleworms, sea lice and others who also come out at night. 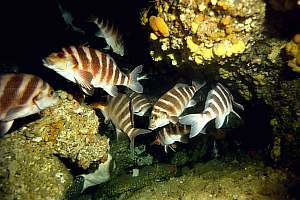 Because their bodies reflect the light so well, they are a prominent feature of any night dive. 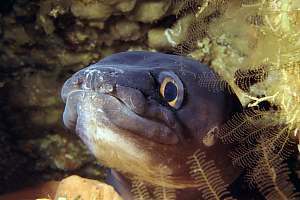 It is not known whether these fish navigate back to their own crevices, or whether they just seek the nearest dark shelter available. f007316: almost equally common as the bigeye, the slender roughy (Optivus elongatus), shares the same crevices with them, and appears to hunt for the same kind of food. It is ecologically perplexing how two similar organisms can peacefully share the same shelter and food source. f009830: resting goatfish (Upeneichthys lineatus) are stunningly beautiful by night, and a delight wherever they appear in the diver's light beam. The two barbels, which are extensions of the mouth, and very sensitive to smell, would allow them to dig for food even during the night. However, they prefer to rest. Large congregations of goatfish by day appear to vanish by night, and it is not precisely know where they go to. f019220: the southern conger eel (Conger verreauxi) comes out only by night, when it hunts for food. It is not just a scavenger, but an active predator and very efficient at that. Although its teeth are negligible, its formidable jaw slams shut over its prey, instantly killing or stunning it. With its very sensitive nostrils, it finds its prey, attacking it without hesitation. 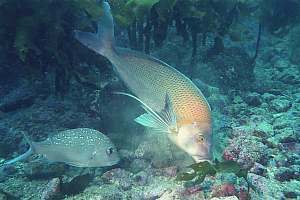 Goatfish, cod, blue cod and others are on its menu. 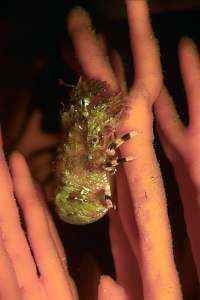 The prey is often taken home to its cave, where it is 'shared' with brightly coloured shrimps. f009820: most fish change their skin colours by night. Here is a porae (Nemadactylus douglasii) in pyjamas. Compare it with its day-time outfit, on right. Porae do not fossick by night, but rest warily. f004623: porae feeding by day. 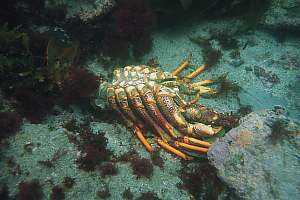 f020128: during the night, the spiny lobster (Jasus edwardsi) is out to fossick for food. Here one is seen at the moment it bumped into a kelp stalk. Their eyesight being weak, they find their way almost entirely by smell and feel. Yet, each time they are able to find their homes. 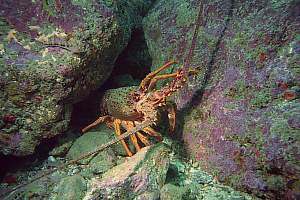 Crayfish are versatile in what they eat, from anemones, seasquirts to dead animals. They can even catch triplefins. [photo taken at the Poor Knights Islands] f017330: a very cryptic crustacean is the killer prawn, also called prawn killer (Ibaccus alticrenatus), both bad names for the animal, because it does not behave like its name suggests, in aquarium studies. It lives in sheltered places, and is very shy of light. It swims in erratic jerks. 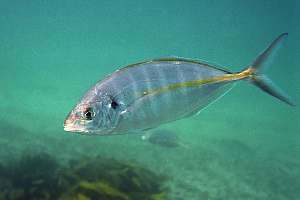 Particularly our commercial fish species, migrate from place to place, and may take up residence in the marine reserve for a while. This chapter shows the more common ones. f006019: a john dory (Zeus faber) waits in ambush behind a rocky outcrop. 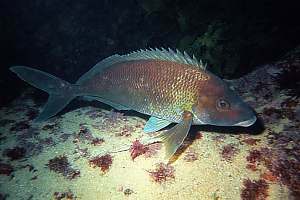 These fish live normally in much deeper water where they are caught commercially in trawl nets. These fish can change colour to suit the occasion. Its extendable jaw and flexible body construction allows it to swallow prey almost as large as itself! f017712: john dory are very adaptive in their hunting strategies. Here one is seen flat on its side, having changed its colour to green, to make it resemble a stone. 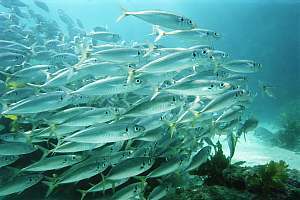 In the top right corner its prey, a wary school of jack mackerels. f002420: a young giant boarfish makes its inspection round in the Goat Island Channel, where it is seen from time to time. People ask "What is the snapper with a hollow long nose?". These fish normally live in deep water, but may take residence for some time in much shallower water. f006124: a group of young giant boarfish (Paristiopterus elevatus), accompanied by one tarakihi (Nemadactylus macropterus), hang-gliding in formation in the current rising above a reef ledge. 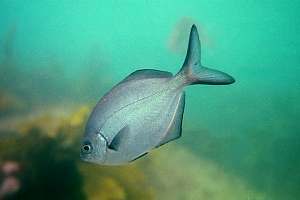 The tarakihi is totally confused about its identity, seeking the company of fish that look about the same, silver with a dark collar. f017920: meet Monkeyface, the legendary snapper of the reserve. It is a very large fish, weighing in at around 15kg, and it is perhaps 40 years old. However, for its daily and seasonal needs it has to leave the marine reserve, which is simply not large enough. Its survival therefore does not depend on the protection we give it, but on its own cunning. It has disappeared several times, once for three years! f017106: not all creatures visiting the marine reserve are migratory. At times, an influx of sessile plants or animals is seen. Here is an uncommon yellow hydroid tree. To receive visitors from cleaner waters, is good news. Those from murky waters may signal that the reserve is degrading. The sea is a fascinating place, with many unbelievable creatures and unexpected processes. In this section we'll collect a miscellany of them. Since the Goat Island marine reserve is so easy to reach, many divers can experience them at first hand. East of Goat Island, at the foot of the rocky shore, extends an area of mixed sand and stones. Storms cannot move the rocks, but they can move the sand around. 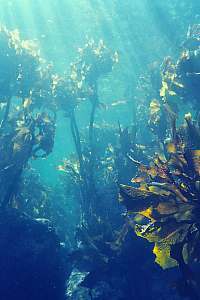 However, the drag on the canopy of the kelp is sufficient to move plants with their rocks attached. On average they are moved towards the coast, and from other places towards this area. In this manner, the cobbles are herded into this special habitat, a process that takes thousands of years. 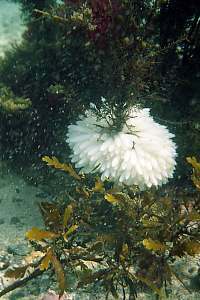 f004632: The photo shows a young thin-finger sponge and in the background isolated stalked kelp plants, each attached to a cobble-sized rock. 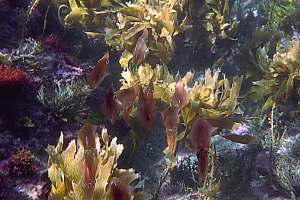 f032214: On right a kelp plant secured to a cobble, living below the kelp's photic zone. Being moved by deep waves and currents, it eventually ends up in a sheltered place. 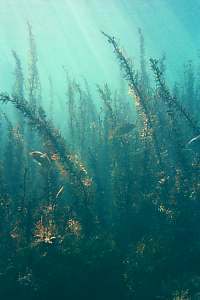 The careful observer will notice that such hopping kelp gardens can exist deeper than the photic zone, beyond which no kelp plants can live for lack of light. The reason is that the white sand around, reflects the light upward, thereby almost doubling the light available to the sparsely populated kelp. It is unusual to find this chapter tucked in behind all others. It should in fact have been at the very front, together with ecology and main habitat zones, because it describes the reasons for some of the major differences found inside the marine reserve, leading to a better understanding of what lives where and why. What has been written here is entirely my own work, based on my own observations. They are not (yet) backed by any scientific research. I therefore welcome any discussion and research. The habitat maps made by Dr Tony Ayling in the mid 1970s, described the topology (seascape) and which main seaweeds grew there. In doing so, it took into account the two major influences on the seascape: sunlight and wave motion. These two factors oppose each other, leading to a surprising variety of life. The deeper one goes, the less light and the poorer biological productivity becomes, which is bad for life. However, at the same time, the destructive action of the waves diminishes, which is good for life. These factors are roughly the same over the entire width of the exposed rocky shore inside the reserve, but may change suddenly over small distances, depending on the shape and orientation of the reef. In all, the mapping method used, has proved to be a very good way of describing a marine environment, but it obscures some of the finer points. In this chapter we'll examine the factors which are not constant all along the shore, such as currents, wave movement, sand scouring, type of substrate (rock/sand) and fouling by mud. The schematic map shown here attempts to map these influences. The map above shows an initial attempt at defining the biogeographical regions of the marine reserve, dictated by the major environmental influences. The map shows the coastline of the marine reserve with Goat Island near the middle. As discussed before, the coast is high, the water deep (15-23m). The rocks west of Goat Island consist of pancaked mudstone, resulting in flat shelves. 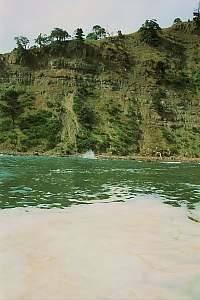 The rocks to the east consist of hard greywacke (a metamorphosed sedimental rock), resulting in a steep coast with deep broken rock, and caves. This coast suffers less wave friction because waves are reflected back, whereas they break over the flats. The broken rocks have vertical water movement as opposed to horizontal for the flats. Before mud from land and coastal erosion became a major influence (since about 1990), the main influences were those of tidal currents, sand movement and shelter. First and foremost, not shown on the above maps and other maps of the marine reserve, is the 40km long beach to the west. It is a de-facto desert for marine life that prefers a hard shore. For migrating fish it doesn't provide shelter and a place to sleep or rest. So Goat Island is an oasis at the end of this very long stretch of beach, an oasis that attracts migratory fish from far afield, such as snapper. Thus Goat Island has always been a 'snapper trap' attracting these fish from a large area around. 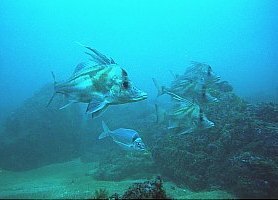 When scientists quote the success of marine reserves, based on snapper counts inside the Goat Island marine reserve, they are either ignorant about the oasis effect, or just dishonest. Currents run around Cape Rodney to the extent that diving there can be hazardous during spring tides. They influence the seascape considerably, bringing planktonic food for schools of planktivorous fish of several species, and sessile filterfeeders like the luxuriant sponges of the deep reef habitat. During storms, sand moves here too, gently scouring the sponges, and keeping them clean from sediment and sticky algae. Here one finds the butterfly perch, which has disappeared from the outside of Goat Island. However, demoiselles have disappeared from here too. Currents also push around Goat Island to become a notable influence on the environment there. 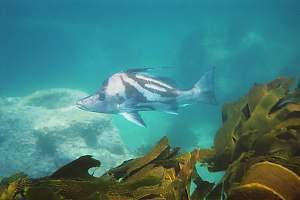 Schools of blue maomao and trevally are found here, and again, a thriving deep reef community, although not as luxuriant as around Cape Rodney. The only notable shelter inside the reserve is found around Goat Island. It starts already behind North Reef, and extends along the sides of the island, all the way to the beach. This area is prime real estate for nearly all species of fish, and a variety of fragile sessile organisms. It produces abundance and variety. 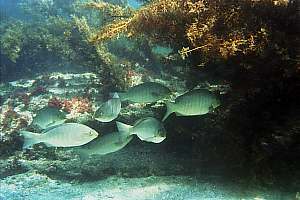 Sand is found over a vast area, starting at the foot of the reef. However, where it does not move, it is of no relevance to the reef communities. On the map we marked the areas where sand is on the move, covering rock flats now and then (the sponge gardens NE of Goat Island), or where it moves inside the Goat Island Channel, at times covering the edge of the kelp forest. Moving sand is a normal feature of the Pakiri Beach, to the far west, but it moves into the rocky areas, where the shelltrap and the mussel bank are found. On these it has a major influence. But the scouring of sand extends further into the marine reserve, causing abrasion and sponges thriving in shallow water. Since about 1990, mud has become of major influence on nearly all habitats inside the marine reserve. It arises mainly from the Pakiri River to the west. In its water catchment area occurs some very steep farm land, with high degrees of erosion and soil loss. During large rain storms, a massive amount of mud enters the sea, and currents disperse it into the marine reserve. Where indicated, the mud affects mainly the deeper areas where it settles over the sand, suffocating shellfish beds. 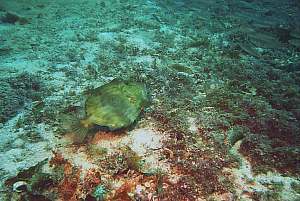 Because of this, the sand bottom (and its inhabitants) has changed considerably in the past ten years. Nothing is known about the seriousness and extent of this. 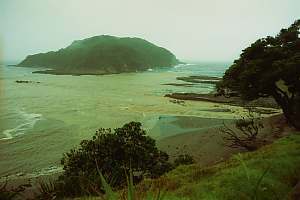 Mud also enters from the Whakatuwhenua Stream, depositing large quantities in the shallow centre of the marine reserve. After years of farming and initial removal of its natural forest cover, the coast bordering the reserve is eroding badly. The unsustainable browsing of introduced possums, adds to the problem. The spoils of slips are waiting for waves to be lifted by a high tide, washing them out, and sending slicks of mud into the reserve. Located so close to the shore, the mud disperses only slowly along the steep coast, which is also sheltering the area from land winds. This mud causes major damage in the areas indicated. f013205: mud enters the reserve from the Whakatuwhenua Stream. It causes major damage to the environment. The photo on right shows the eroding bare rocks, denuded from their original native vegetation by initial burning, weed spraying, possum browsing and accelerated erosion. At the bottom of the slips the sea carves their spoils out, leading to mud clouds at every spring high tide. In the foreground the water is in dense plankton bloom, foaming in the process. Visibility under water would be less than 2m, which is degrading the environment. f980200: the steep pancake coast, and in the foreground thick dirty foam produced by the dense plankton bloom underneath.